But for the vagaries of fate and fortune, pianist and composer Kishon Khan could be sitting at his workstation preparing econometric models. Instead, the 38-year-old British Bangladeshi musician is making waves with his Afro-Cuban-Bangla Jazz bands Motimba and Lokkhi Terra. Through sweet yet fiery performances at venues ranging from Queen Elizabeth Hall to the Kew Gardens, Kishon and his group have become one of the hottest properties on the World Music scene. When Kishon Khan led Motimba out onto the stage at Radisson Water Garden Hotel for their first concert in Bangladesh on 30th October, no one knew quite what to expect. Bangladeshi audiences have not had much exposure to Afro-Cuban music, and the island is better known for its cigars and Fidel Castro. Kishon has never performed in public in this country, and had no idea how the music would be received. The ambitious tour to Bangladesh, a country dominated by pop and rock, itself took courage. But courage is something Kishon Khan has in abundance. The product of an Asian society in which a young man is not considered truly successful unless he is a doctor or an engineer, Kishon defied conventional wisdom to become a professional musician. He studied Economics at the University of East Anglia, but soon realised music was his calling. A stint in Cuba in his early twenties focused his interest on the aggressive, intensely rhythmic Afro-Cuban melody known as Timba. Soon Kishon had his first Afro-Cuban Funk Jazz band. 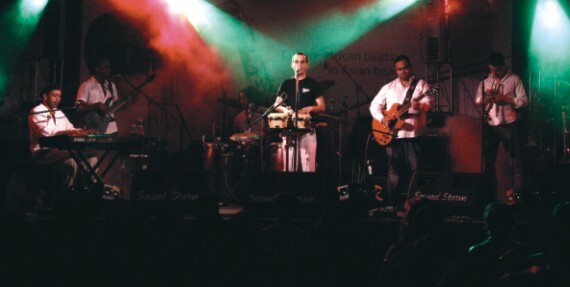 Although the band Motimba has been in existence for almost ten years, this is the first time the outfit has toured Bangladesh. Class Act: (from left) Tansay Ibrahim, Jimmy Martinez, Justin Thurgur, Kishon Khan, Oreste Noda, Javier Camillo, Graeme Flowers , Robin Banenerjee. It took only a few minutes for the magic to take effect. As the Radisson Hotel tennis court came alive with irresistible rhythms, the audience started to sway and tap their feet. Couples got up to dance. Not even the humidity and the mosquitoes could dampen the enthusiasm of the crowd. The first half of the show lasted the scheduled 45 minutes, but the second half carried on for well over 90. Such is the magic of Timba. 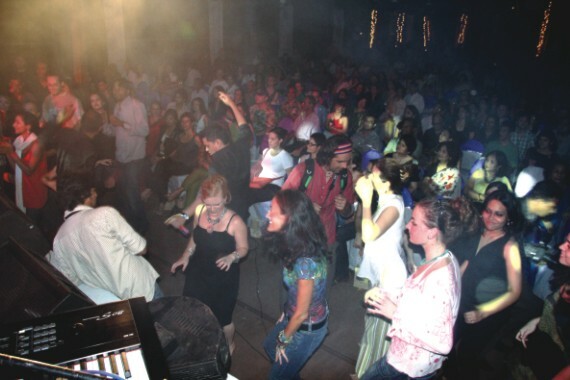 The relatively new style of Afro-Cuban popular music, very groovy and danceable, has taken the world by storm. Kishon’s Motimba (More Timba) performs Timba with vim and vigour. Their elaborate melodies, intense improvisation, epic emotional sweep, exotic textures and infectious energy is guaranteed to sway audiences. Fusion music can become complex, but Motimba crosses several cultural and musical boundaries with hardly a flaw. The band’s delightful eccentricity and invention interplay with the Caribbean island's trademark rhythms. The outfit has wowed audiences at much larger venues than the Radisson. They have played at famous venues in the UK, including the Royal Albert Hall, the House of Commons, Queen Elizabeth Hall, several major London Music Festivals and at specially commissioned shows at The British Museum and National Portrait Gallery. They have received rave reviews from critics. “Groundbreaking”, said the influential music magazine Straight No Chaser. “Exciting…and effortless,” was the verdict of BBC Radio 3. Such success has been made possible through the involvement of a truly international cast of characters. Justin Thurgur, the trombonist and Graeme Flowers who plays the trumpet are English. Oreste Noda the percussionist, and Jimmy Martinez on bass are Cuban. Also from Cuba is the ebullient vocal Javier Camillo. 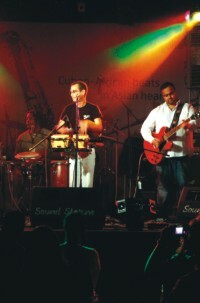 Robin Bannerjee on guitar is of Indian origin while Tansay Ibrahim the drummer hails from Cyprus. Then there is Kishon himself, Bangladesh-born Briton and pianist extraordinaire. Kishon Khan gave up a career as an economist to form Motimba and Lokkhi Terra. Most of the band members are well-known musicians in their own right. 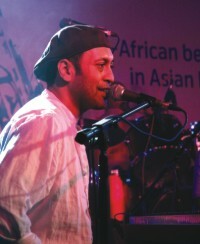 Justin Thurgur, who co-writes much of the music with Kishon, has worked with ex-Fela and Femi Kuti keyboardist Dele Sosimi since 1998, and is a key member of the famous British folk band Bellowhead. Graeme Flowers has just finished a world tour with Kylie Minogue, and works regularly with Kyle Eastwood. He has performed on and written music for three Clint Eastwood movie soundtracks, and is a regular at major jazz festivals. Oreste Noda is one of the most sought after percussionists in London, performing all over the world from Havana to Japan, and throughout Europe. His compatriot Jimmy Martinez, considered the UK’s foremost Cuban bassist, came over to London with the internationally acclaimed Cuban band Asere. Since settling in London, he has proved himself as a formidable and versatile musician working with stars such as Enrique Iglesias and Nelly Furtado. Robin Banerjee is one of the UK’s top young guitarists, and Tansay Ibrahim has supported such artists as Bjork, Boy George and Jackie Graham. Motimba live in concert at the Radisson. There is an easy camaraderie among the band members -- the result of years of working together. At the jamming sessions they laugh and joke, and point out the mistakes in each other’s performances. The music is composed by Kishon but with input from everyone. Since bursting onto the music scene in the UK in June 1999, Motimba have built up a reputation for powerful and energetic performances using a unique blend of very danceable and spicy Cuban Timba, Son and Cha Cha Cha interspersed with reggae and rap. 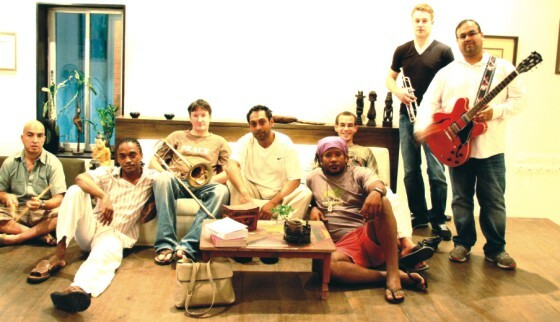 The group released its first album, Monkey Vibrations, in 2003 to critical acclaim. The album gives listeners a taste of the exuberance the outfit exerts on stage, with the tight rhythm section, hot horns and energetic soloing really taking off behind the vocals. Underneath the horns and the rapping one can still hear the African rhythms, largely unchanged for generations. Although Motimba has been doing the rounds for a decade, Lokkhi Terra is very much a work in progress. It is a fusion project in which Timba and Salsa meet the Taal, Afro-Cuban funk meets the Sub-continental raag, and the sound of trumpets and trombones meets the tap-tap of the Tabla. Lokkhi Terra is a bigger band in terms of numbers – with more instruments and personnel coming in. 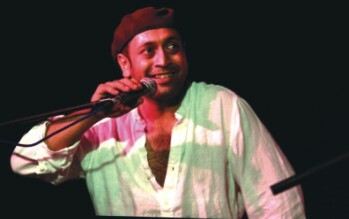 When Lokkhi Terra performs, the vocal is usually Sohini Alam or Aneire Khan, both London-based Bangladeshi singers while Mithun Chakraborti plays the Tabla. All of the performers in Motimba are established musicians in their own right. Motimba serves up a spicy mix of Afro-Latin music that sways audiences. Globalisation may be a fighting word in politics and business, but in the realm of music it has a nice ring to it -- a funky beat, and a tantalising groove. Motimba is a band composed of virtuoso performers, possessed of an absolute delight in the music they are playing. Kishon Khan and his band may refuse to take themselves too seriously, but through the sun-drenched effervescence of their music Motimba/Lokkhi Terra are already building bridges, spanning cultures and continents. Q. You started learning the piano at age 4. Did you want to be a musician since childhood? Yes, I was trained classically at a very early age. Better to say I was forced to learn. My mother wanted me to learn the piano. I liked the piano, but hated my Russian piano teacher. So I can’t say I was really enthusiastic about being a musician in my boyhood. There was one occasion when I bandaged my fingers and told me teacher I had a football accident. When it didn’t heal for a week, my teacher told my mother that she was very worried about me because my wound wasn’t healing. My mother knew I didn’t play football. Boy, did I get a scolding! Q. So what was your main inspiration for wanting to become a musician? As a teenager growing up in London, I listened to a lot of music. I took a jazz course when I left school. Then I got into bands at University of East Anglia because I could play the piano, and my skills were in demand. I realised I could make money out of it. I started playing with different bands and musicians and learning different types of music. When I went to Cuba, I fell in love with Afro-Cuban music, and that love affair continues to this day. Q. Tell us about your time in Cuba. I was amazed by how similar it was to Bangladesh. We are both emotional nations. And you know, the music is very soulful. When I was in Bangladesh I was fascinated by the call of the peanut-seller. Badaaam! The timbre of the call was magnificent. In Cuba I heard the same call. Manieeees! Q. Is there any particular type of Bangladeshi music that you are interested in? Bangladesh has such a treasure trove of music. During my visits to Bangladesh I would spend time in the bustees and shanty towns in and around Dhaka, making friends at grass roots level, understanding the people and their way of life and listening to their simple soulful music. I love Lalon and Baul music, and it shows in Lokkhi Terra. Q. How has the reception been so far on the tour? It’s been fantastic. The audience, the sponsors everyone has been great! But I was very disappointed by the response of the British Council. This is a British band, but although we approached them, the British Council showed no interest in the tour at all! Q. How do you think Lokkhi Terra will be received in Bangladesh? It may come as a shock to those who believe in putting music in boxes and labelling them. I don’t believe music should be bound by rules, although I do agree that you should preserve the essence of a particular piece of music. If people listen to Lokkhi Terra and say they don’t like it that’s fine, but they shouldn’t say you cannot do this! Music like all aspects of culture is dynamic.